As a kid, I had much fun playing with Kenner's Super Powers Collection and Mattel's Secret Wars Collection. Or was Secret Wars better? Firstly, I liked both. I am sure both were manufactured very well. However, Kenner's Super Powers Collection had those mini-comics inside. And each character had its own feature. I mean, Batman, my favourite figure, had the "Power Action Punch Feature". While Mattel's Secret Wars figures had a holographic shield, there weren't any mini-comics! Nooooo! I probably played more with the Super Powers Collection. And the mini-comics are still treasured by myself. Also, I enjoyed the "cross-pollination" aspect of those toys. It was great to have Bats and Robin trapped in Doctor Doom's Tower of Doom; or have Captain America using his shield against the Joker and his mallet. 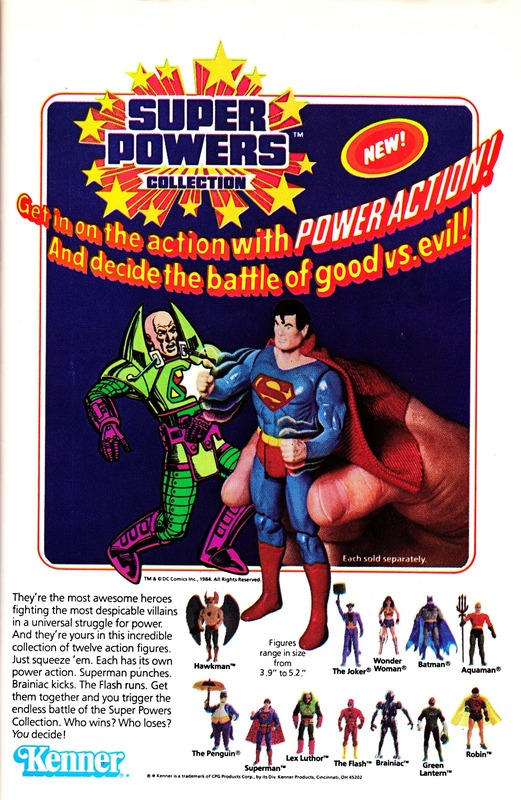 While I did enjoy the Toy Biz DC figures (based on the Keaton films), I'll always have a fondness for Kenner's Super Powers Collection. Plus, there was the five-issue mini-series, too. I was too old to play with them but I did have a big chunk of the Super Powers collection: Superman, Batman, Robin, Wonder Woman, Aquaman, Flash, Green Lantern, Hawkman, Green Arrow, Martian Manhunter, Red Tornado, Firestorm, Doctor Fate, Captain Marvel, and Plastic Man. I thought they were quite well done, especially compared to the Mego figures. I gave them away decades ago, which I regret now. 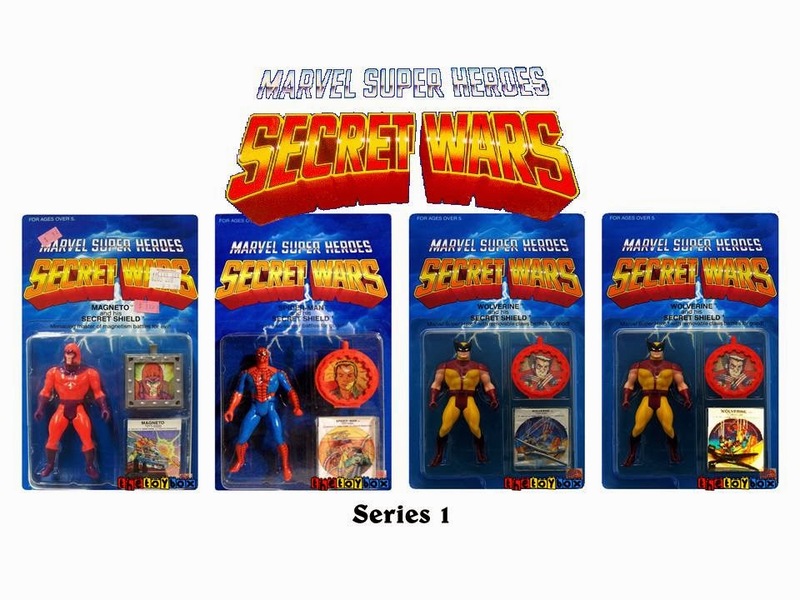 I never had any interest in the Secret Wars set. I summon the lost treasure! the figures "moved" in some way. Super Powers hands down for me too. I still have one or two of them, never owned any of the Secret Wars figures. Off-topic, I did like how the Masters of the Universe figures had mini-comics, too. I wish the likes of Thundercats and Transformers had done the same. Also, that time period was about the "thrill of the hunt". Today's generation, bless them, will order a figure from Amazon (maybe). Back then, we hunted for things. The Flash was a hard one to track down as was Brainiac. And I am not sure the Clark Kent figure was available here in the UK. Today, I'd just order him from overseas or go on eBay. Regarding Secret Wars, I found it odd that some of the figures released were of characters who weren't in the comic story. The likes of Daredevil and Electro, if memory serves me right, were not in the comic, but were released as figures. As a kid, I judged toy lines by their playsets, and I found the Super Powers Hall of Justice and Secret Wars Doom Tower equally compelling. The HOJ had more parts, colors, and complexity, but Doom Tower made up for all of that with sheer imagination. I was more of a DC kid, but I rocked the heck out of that tower, the Captain America Cycle, and that Doom wheel thingy too. Really really fun stuff. Very true, I had hours of fun with the Tower of Doom (which I had Batman and Robin break out of). Super Powers by far! I had them all (and still do!) except for a few towards the end of the series. I have the Hall of Justice, Super Mobile, Bat Mobile, and the Lex Soar 7 too! I remember how hard Wonder Woman was to find. My mom took me to Toys R Us and they didn't have it, but she got me the Secret Wars Wolverine, ha! Finally she ordered Wonder Woman from Sears and it took months to come. For some reason, Firestorm was my favorite. I remember Brainiac's leg broke off and one of my friends accidentally broke Martian Manhunter. My Dad put him back together but his "power" no longer worked. The comics were fun and the ID card on the back was too. Still have those as well. This is weird. The leg on my Brainiac broke, too. A manufacturing flaw? Yep. My Brainiac's leg broke. 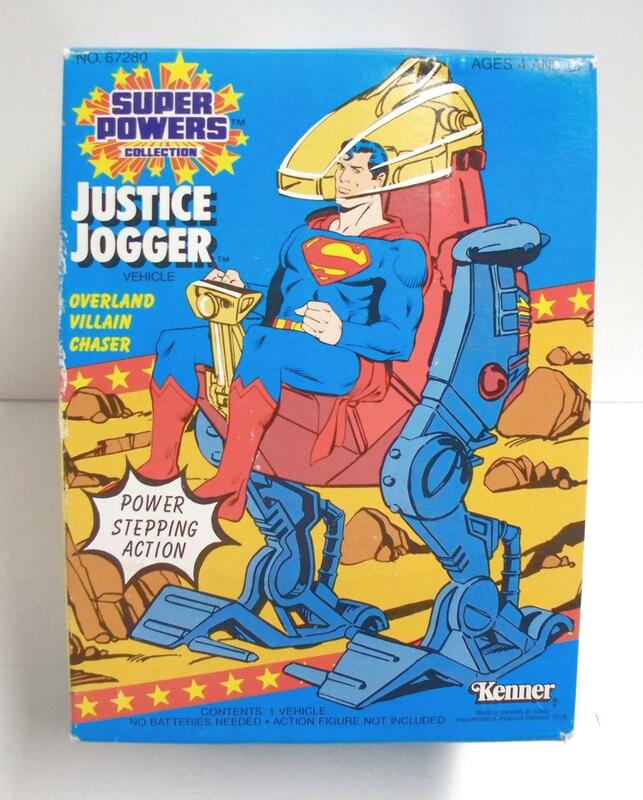 I never asked for the Justice Jogger. I remember thinking that Superman really wouldn't need it with the super mobile (which was really cool). The Lex Soar 7 came with a piece of kryptonite. Indeed sounds like Brainiac had a defect! I still have the broken leg, hahaha! It seems like I sent in proofs of purchase or something and received a Super Powers poster. I think I got Steppenwolf the same way. I remember he came in a little brown box in the mail. Super Powers for the win. Just so much more variety of heroes and villains. Without a stupid shield. Wow, gotta have been a flaw with Brainiac, then. Or we were all unlucky! I like the Supermobile, too. Was the Clark Kent mail order figure US/Canada only? I seem to recall being disappointed that it wasn't going to show up on these shores. Incidentally, save me Googling, does anyone know the names of every company, in sequential order, who had the DC and Marvel licences? Didn't Toy Biz take over DC from Kenner? And didn't Tyco take over Marvel from Mattel?